Welcome to Day 9 of The 12 Days of Holiday Projects Blog Event. Several crafty blog friends and I decided to post one holiday project a day for 12 days - just for fun. The projects will be anything crafty like cards, ornaments, wreaths, advent calendars, etc… We’re posting projects we made using products we like and hope they will give you some inspiration for your own holiday craft projects. You will find links to all the other participating bloggers below. Hopefully you can find time to look at the other blogs and leave comments on any that inspire you. If we inspire you to make, something please let us know - we would love to see. Happy Holiday Crafting!! 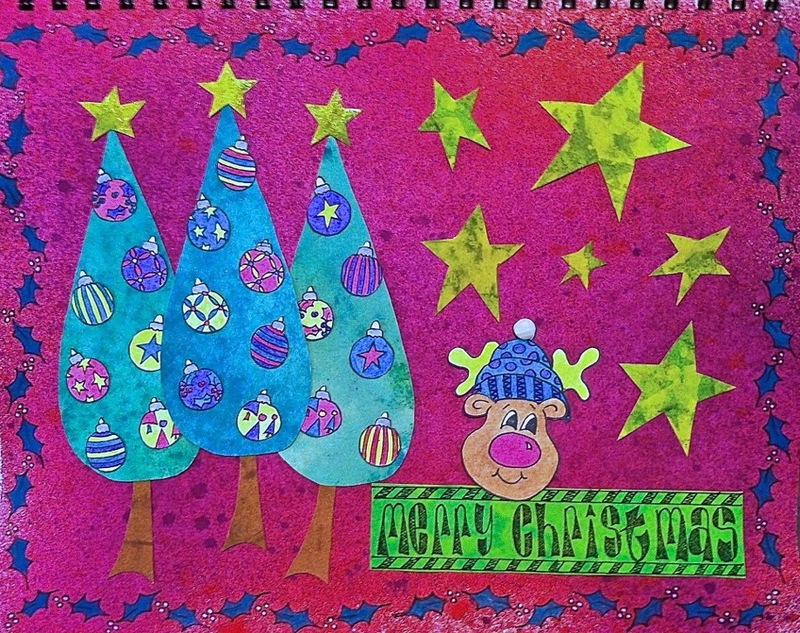 For my Day 9 Project I'm sharing a Christmas art journal page. I made the background with Dylusion pink & red ink sprays. I cut the trees and stars using Dylusions stencils on tags and backgrounds that I had in my stash ready to use. I also used Dylusions stamps for the border, reindeer, ornaments and sentiment. I colored the stamped images with Prismacolor pencils and blended with Gamsol. I added Distress Stickles in Scattered Straw to the stars on the trees and a rhinestone to the reindeer's hat. I also used an American Crafts white gel pen on the border berries. I haven't worked in my journal in ages and this page took a really long time to make, but I had a great time creating it. I hope you can stop by tomorrow to see my Day 10 project. LOVE it Donna! It's just sooo happy and bright! Gorgeous Christmas card, love the design and the papers. hehe how cute... love all these fun bright colors..